Visit shipznet at the Maritime CIO Forum in Shanghai and experience our new 4G hard- and software, including our newly designed radome-antenna. Capacities of communication systems are a key point in modern merchant shipping. User data rates will keep rising, but maritime communication remains wireless and relies on sharing limited physical resources. 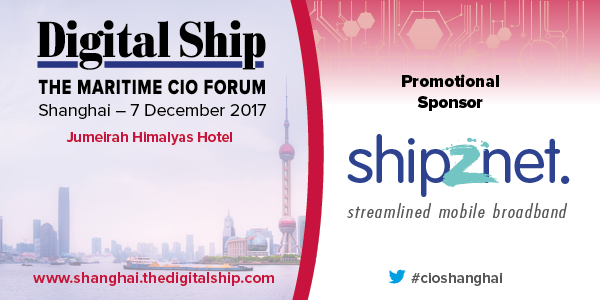 Take the opportunity and visit us at the CIO Forum in Shanghai to experience our shipznet solution to provide your vessel with a mobile internet access. Backup your VSAT with shipznet in near shore areas and ports using a reliable 4G connection and download rates up to 300 Mbit/s. We offers high quality terrestrial marine equipment with more than five years proven performance, manufactured and developed in Germany! We are looking forward meeting with you in person.